Manuka is a precious honey with many therapeutic benefits. The honey owes its growing popularity to its strong antibacterial properties that have turned it into a natural remedy for a wide range of conditions. However, not all manuka honey is the same. Honey produced in the same season and from the same region may vary incredibly in terms of its content of antibacterial elements and, as a result, medicinal value. This has lead to the development of several grading systems such as UMF, MGO or KFactor that measure the properties of the honey. What are the grading systems for manuka honey? 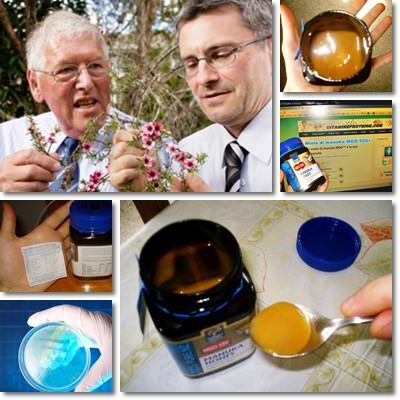 There are numerous ways of grading manuka honey, but not all systems are trustworthy. The only certified grading systems of manuka honey are UMF, MGO and KFactor. Each of the three measures the properties of the honey differently, the ultimate goal being to evaluate or estimate the therapeutic value of the honey for the end consumer. Choosing certified honey brands is just as important as knowing what the letters and numbers on the label mean so here is everything you should known about manuka honey grading systems. What does manuka honey UMF mean? UMF stands for Unique Manuka Factor which refers to the element in manuka honey that makes it unique and superior to all other honeys. This element is the antibacterial compound called methylglyoxal, the principal active ingredient responsible for most of the health benefits of manuka honey. At the time the honey started to gain popularity there was little known about its composition. So the therapeutic effects it was famous for were presumed to be the result of a compound unique to manuka alone, but because it was not yet identified at the time, it was called the unique manuka factor, UMF for short. UMF is also a registered quality trademark of the Unique Manuka Factor Honey Association from New Zealand, formerly known as the Active Manuka Honey Association. The association has coined the term (it owns it) and licenses it to producers and beekeepers that meet the strict UMF quality trademark regulations. Honeys are subjected to standardized testing to verify their quality and confirm their UMF status, but the association also performs random tests on various samples already available on the market to ensure only the highest quality honey bears their label. (UMF5+) (UMF8+) The honeys rated UMF5+ and UMF8+ have a minimum antibacterial activity and low overall therapeutic value. (UMF10+) (UMF12+) Have a medium antibacterial activity and therapeutic value. (UMF15+) (UMF16+) (UMF18+) Manuka honeys UMF15+, 16+ and 18+ are considered to have a high therapeutic value. (UMF20+) (UMF25+) Manuka honeys graded UMF20+ and UMF25+ exhibit the strongest antibacterial action and boast the highest therapeutic value the UMF grading system measures. What does manuka honey MGO mean? MGO (or MG) stands for methylglyoxal which is the main biologically active antibacterial element in manuka honeys, responsible for their excellent health benefits. MGO is basically the unique manuka factor, the element that makes this particular honey superior to all others. At the same time, it is an internationally recognized grading system for manuka honey established by Professor Peter Charles Molan from the University of Waikato, New Zealand. Professor Molan (top left picture) identified the unique properties of manuka and set to establish a standardized model for measuring these properties and their therapeutic value. Thanks to the research conducted by Professor Thomas Henle (top right picture) from the University of Dresden, Germany, the unique manuka factor would soon be identified as methylglyoxal, or MGO. Methylglyoxal is different from the glucose oxidase enzyme that forms the antibacterial hydrogen peroxide in other honeys, hence the reason the antibacterial activity of manuka honey is also known as non-peroxide activity (because its main biologically active antimicrobial component is not peroxide-based). The identification of the mysterious element allowed for its measurement in the harvested honey and lead to the establishment of an efficient standardized grading system known as MGO. As a grading system, MGO measures the content of methylglyoxal in manuka honeys and serves as certification for the quality and purity of the honey. The MGO grading system measures the antibacterial content of methylglyoxal per kg of manuka honey with great scientific precision. Is MGO content stable? Manuka honey has been found to increase its content of methylglyoxal with time. Research shows the simple carbohydrate or sugar DHA converts into the antibacterial element methylglyoxal, significantly increasing the initial MGO content of the honey and the honey’s antibacterial and overall therapeutic value. After about 4 years, the MGO content begins to decrease (Processing and Impact on Active Components in Food). What does manuka honey KFactor mean? KFactor is a grading system that measures the content of manuka pollen in manuka honey. The idea is that the more manuka pollen the honey contain, the higher its purity and, naturally, the stronger its therapeutic effects. The grading system goes from K12 (with a minimum of about 65% manuka pollen) to K16 (75% manuka pollen) and K22 (90% manuka pollen). However, it is reportedly difficult to distinguish between manuka pollen, kanuka pollen or the pollen of related species, hence the reason why this particular system is not particularly appreciated. Are there any other reliable grading systems? Other grading systems for manuka honey may include BioActive, TA or A, NPA (non-peroxide activity) or various systems with numbers of letters. 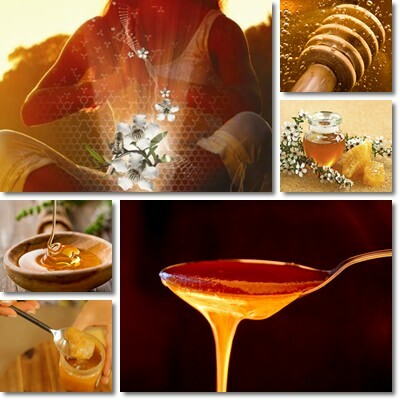 Such systems do not offer any real guarantee of the quality, safety, purity or therapeutic action of the honey. When it comes to manuka, it is important to always choose certified brands, not obscure grading systems. Just as important, make sure the label is correctly written. A correctly labeled manuka honey should include the trademark certification, be it UMF, MGO or MGS, followed by the number representing the value it measures and the plus sign indicating the fact that it is a minimum measured value. 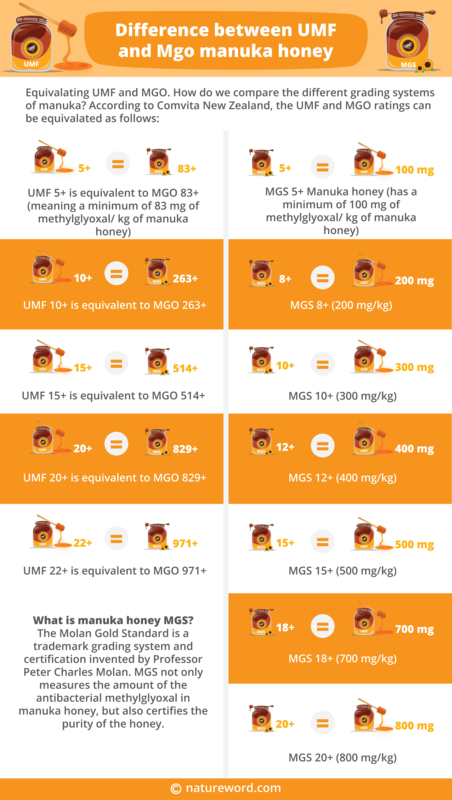 Examples of correct labels: UMF 15+, MGO 550+, MGS 20+ and so on. And remember, values as low as UMF 5+, UMF 8+, MGO 30+, MGO 83+, MGS 5+ mean it is no better than a regular honey. Higher number values like UMF 15+, UMF 20+, MGO 550+ etc. are more of a guarantee of the health benefits of manuka honey. Conclusion. Many grading systems for manuka honey have been established over the years, but few have reached a level of standardization and accuracy that would allow them to be used to certify the purity or quality of this special honey. The most trutworthy grading systems we should look for on the label are the Unique manuka factor (UMF), methylglyoxal measurement (MGO) and the Molan gold standard (MGS). Just as important as getting certified honey is making sure the honey is correctly labeled, so check the origin of your honey, its label and what the values written on said label mean to make sure the honey delivers the therapeutic effects you are looking for.